Eisner-nominated author sounds good doesn’t it? 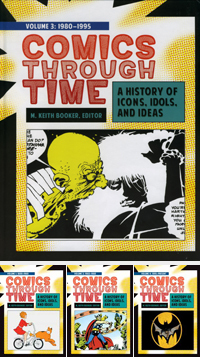 A few weeks ago I came the closest to that accolade as I’m sure I’ll ever get with the fantastic news that the four volume Comics Through Time encyclopedia project (to which had a small part in penning the entry on uncredited Batman co-creator Bill Finger) has been nominated for a 2015 Eisner Award in the “Best Comics Related Book” category – Congratulations to everyone on the production and publishing team, and all who participated in the project. Just to confirm that I have to have to pull out of the first Peoria Artist and Comics Expo in May due to family commitments (But it’s for a happy reason – the birth of our grand-daughter is now scheduled on the same weekend) – I wish the organizers all the best for the show. I had a great time at the Windy City Pulp convention in Chicago, where as well as participating on a fun panel on the future of New Pulp , I was lucky enough to spend time chatting with publishers Ron Frontier (Airship27), and Tommy Hancock (ProSe Press). July 24-26 – ArmadilloCon – Austin, TX. Lotus Ronin: The new Asian Pulp anthology from prose ProSe Press is in production. I’ve done the final copy edits on the debut tale of my new pulp character, The Lotus Ronin, and am waiting for news on a possible publication date. James Bond Lexicon: A Guide to the Worlds of 007: The manuscript for our upcoming James Bond Lexicon has been delivered to the fine folks at Hasslein Books for copy-editing. If things stick to schedule we are aiming for publication around the end of September or early October. Meanwhile work continues on our U.N.C.L.E. Lexicon project, “The Lexicon Affair” – look for more updates on this next month.